Musings of a Menopausal Melon - mmm! quilts: It's a Wrap - Another Project Done! We bought the clothesline at the Sarasota Quilt Guild Show last winter. Nancy already had the book, as she had already seen these cool bowls in a quilt shop. 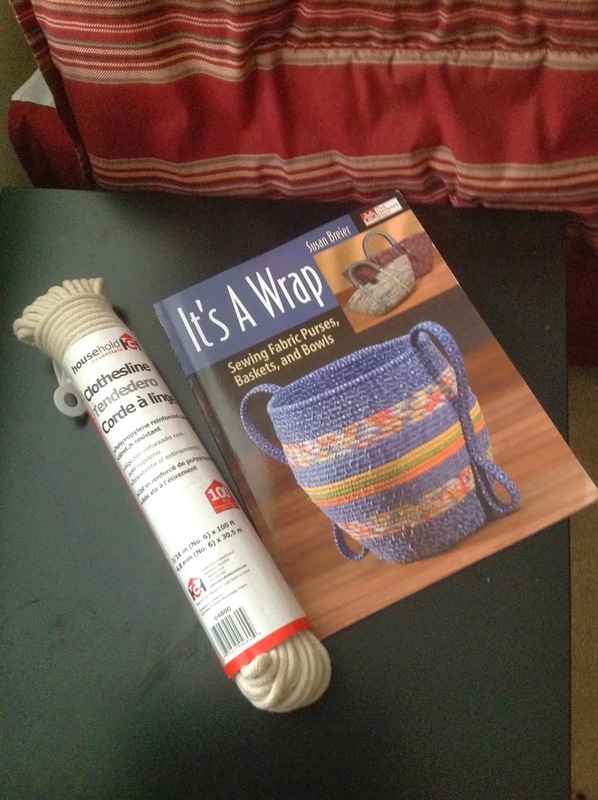 I ordered the book, It's A Wrap off Amazon and intended to make a bowl over the summer. It didn't happen. So when Nancy and I walked home last Saturday morning from my Yin yoga class, she suggested we get together the following weekend to sew. I said why don't we make a bowl? So we did. Because my stash is in Kingsville, I went to JoAnn's and bought some on sale ($5/yard) cotton. 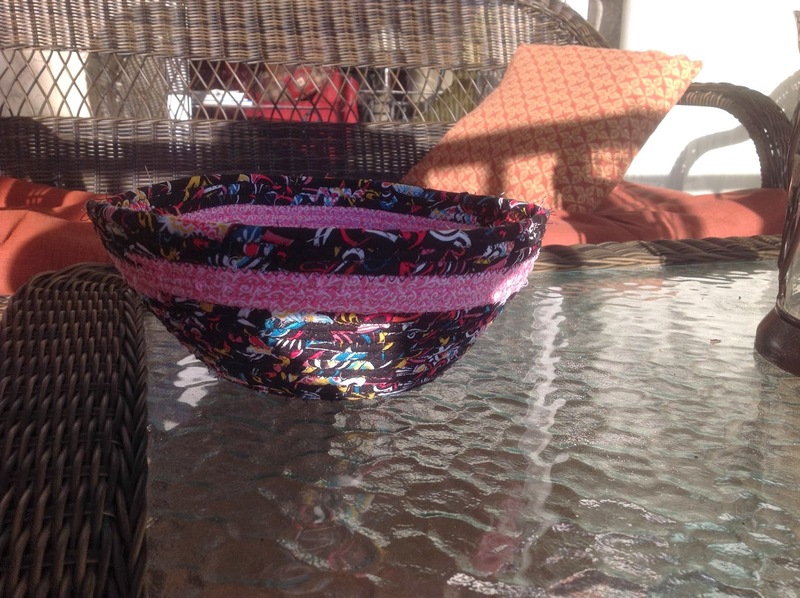 To make this bowl cost me less than $3 for the fabric and approximately $2-3 for the clothesline rope. So this is a pretty inexpensive craft! The instructions are clear, logically laid out, and easy to follow. There are great pictures accompanying the techniques used to create various shapes of bowls or purses, as well as loads of great pictures of finished bowls and purses with embellishment ideas. I bought enough of the black multi-coloured print to make 2 bowls, and having cut the strips for this one, I think I'll have enough to make 3. 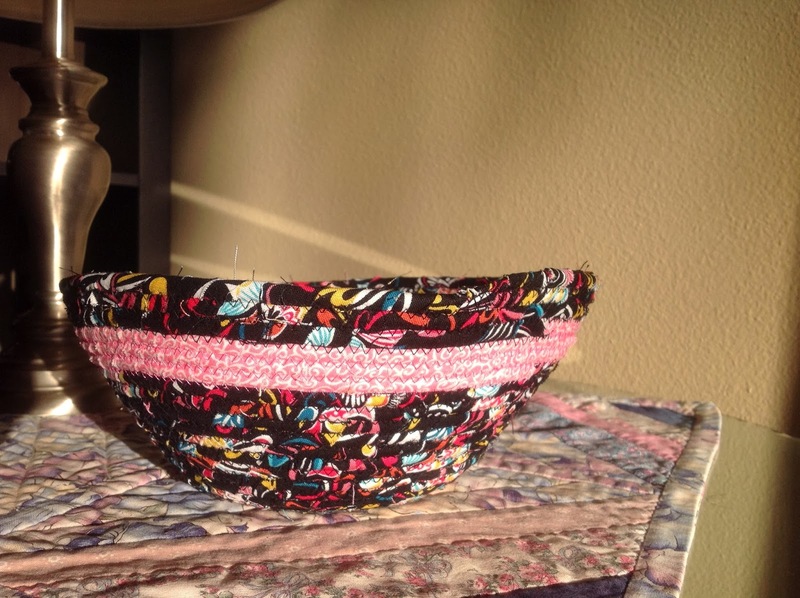 I picked up 1/4 yard of the same fabric in turquoise to match the pink so I'll have a pair of bowls that coordinate! As my practical husband would say, "What are you going to use it for?" Well, this one I'd thought of using in my sewing room to hold thread cones or various other sewing gadgets. 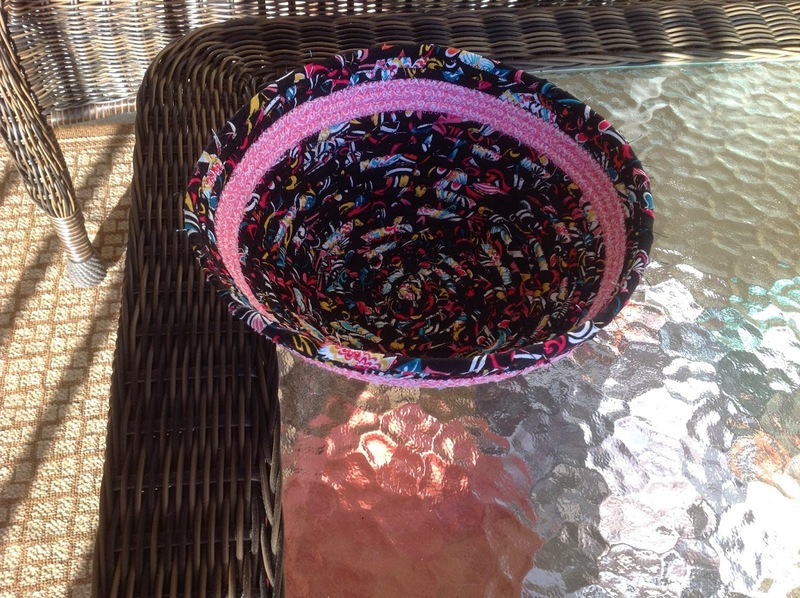 I can see using a bowl for bread (I do use a fabric bowl made years ago with timtex for that purpose), to hold jewellery, (I also use another timtex fabric bowl for bracelets) to hold small toiletries in a bathroom, or simply for decoration, depending on the fabric choice. Lots of possibilities here! Well, this is how the Internet vortex occurs: I googled "fabric bowls made with timtex" which took me to that timtex blog post on CT Publishing's blog. How interesting of a story is that? I know I'm not at my 5 projects completed per month quota if I wanted all 26 completed in the 5 months we are here, but I sure am feeling a wonderful sense of completion here. I think this might be #7 or 8? I'll have to count them up! Sounds like a great way to spend time with your friend AND get a lot of quilting done!